You are here: Home / Blog / Cosmetic Dentistry / Cancun Cosmetic Dentistry has warranty on their dental pieces! Accidents can always happen. This is not a secret, and it is actually very normal. That’s why we offer a 5-year warranty for our dental pieces. We have noticed that in United States besides being a very expensive country for medical and dental services, many dentists do not offer this option. Some of our patients have a very strong bite when they eat or many others things can occur that can affect crowns, implant bridges, snap in dentures and even All-on-4, but we are prepared for that! We have warranties in all our dental pieces, including dental implants. All materials here have a warranty at our clinic! So, you can take a breath, and relax on your dental vacation. I wanna say that Alain came a couple of years ago, and you know what? He had a broken bridge. And what happens? Doctors always say the good things, but what if somethings breaks…? And if you need to have any warranty or something? And tell me what happened afterwards? Yeah! And then I have to back to scuba diving and deep sea fishing, it’s kinda hard! It was a warranty, and also it’s such a pleasure to have you here! You are part of the family! And here you don’t have to paid nothing. And it´s one of the things we know that can or might happen. Yeah! We do something! We have strong biters. Look at him! Perfect! And we have strong biters that even with a nightguard, and even with taking care of those teeth he broke something, he came back, we fix it up, and then you´re great! Yeah! And then I am great to go back and maybe break again and come back! Ok, but then you will have another excuse! Thank you my friend! 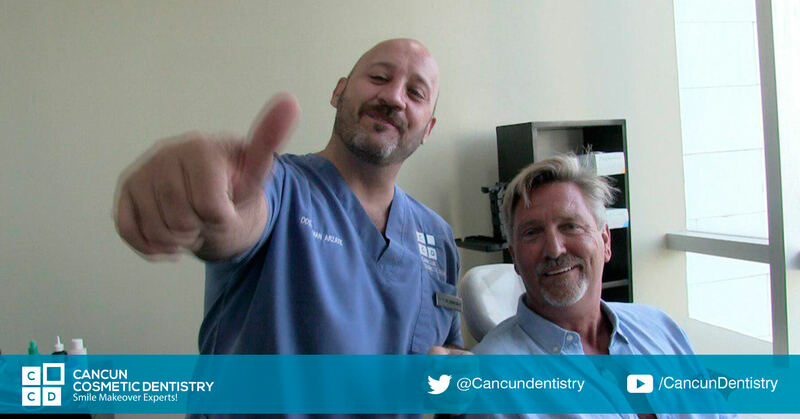 Happy Patient found affordable dental implants in Cancun! Amazing results in Cancun Cosmetic Dentistry (video testimonial) Dental implants or dental bridges for teeth in posterior area?